Tuesday, August 15th, 2006 | 11:28 am	and filed in Friends, Music Software. 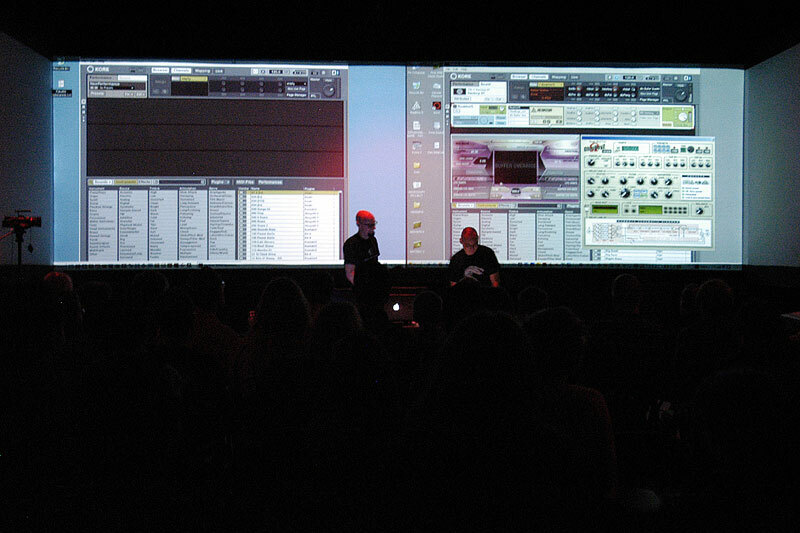 Native Instruments has an intensive KORE demo on tour and last Saturday, they launched from Recombinant Media Labs in SF. Richard Devine along with NI Product Specialist, Josh Fielstra presented a fairly intensive 4 hour lecture about this new system. I figured I would drop in and say hello and see what KORE was all about. KORE itself is simply an environment and uses virtually no CPU processing. The environment extends from the software realm to the real world through the KORE controller which is a USB audio and MIDI interface as well as custom hi resolution control surface that communicates with the software environment. The software itself hosts all of the NI products like Absynth, Reaktor Ensembles, Battery Drumsets, as well as almost any plug-in: AU, VST, RTAS, etc. Within the software, you can configure stacks of plug-ins to create instruments and effects chains and custom weird sound fx systems - as Richard so deftly demonstrated. Then save the KORE patch with Tags to describe the type of sound. You can then quickly browse or search out categories of sounds based on these tags. I was impressed with the potential of KORE, and it only crashed twice during the four hours, so it’s pretty stable. If I were more of a plug-in user, I would probably be all over a KORE system. As it is, i’m more of a load, sequence and freeze type of user, but if you’re a KVR-addict, then you need KORE! At the end, there was a special guest appearance from Dan The Automator. Richard interviewed him about production techniques and the audience had the opportunity to ask both of them questions about tweaking, instruments, and the music biz. People were also treated to a tour of the facility by Naut, the RML director of operations. Later that evening there was a Remix Mag/NI party down at #111 Minna Gallery where several local bands performed including Dan The Automator and later on Richard Devine. Unfortunately, I couldn’t stick around that late. KORE got a great review in the most recent issue of SOUND ON SOUND. It looks pretty amazing, especially as the hub of a software studio which (as you already said) focuses primarily on plug-ins. It’s too bad Reason’s instruments can’t be used as plug-ins! Yeah, it’s impressive. If you’re already a big NI user and have Komplete, then Kore is definitely a plus, or even if you’re just big into VSTi, or other softsynths, it’s like having a combinator for all of your software. I think what I’m really curious is how the sound quality on NI products compares to Reason. Well you will be surprised once when you try NI and compare it to Reason within sound quality aspect. I dont want to bash Reason synths as they can be good sometimes but IMO they cant even compare. Once when you try Reaktor you will see what i am talking about. Anyway i hope that Props will update Reason filters on devices (oscilators on synts too) as this can bring dramatic sound quality expansion to Reason as it is. I have to agree.. NI products sound much better than reason.. Peff gets a great sound out of reason but he’s an uber power user (have you seen those template files) Reaktor just sound huge out of the box. Pity that kore doesn’t live up to the rest of NI quality. I took the time to download and install the Reaktor 5 demo this weekend, and I have to agree! The sound quality is pretty huge, although I wonder if part of that is due to the big names they have designing their presets. That being said, the two software bundles serve different purposes. Reaktor has very powerful, very hungry synths for people who need pro sounding audio from the get-go. Reason, I feel, appeals more to the hobbiests that are so rampant, especially in electronic music. Out of the box, in a few hours, someone can be pumping out a whole song! Even for pros, that’s a big deal, I think. Reason is an amazing tool for writing music, and building a track from scratch. Not having to deal with loading/freezing those hungry plug-ins, or even worse, plugging in and putzing around with hardware makes composition much more a painless (and enjoyable!) process. After saying all that, I’m still planning on buying Komplete 3, and at least trying out Kore. The sounds are simply too big! Reason, however, will without a doubt remain the ‘first step’ in my workflow. yeah reason is the ultimate sketchpad.